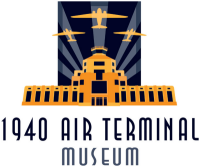 The 1940 Air Terminal Museum is a 501(c)(3) non-profit organization. All proceeds from admission, Wings & Wheels, raffle ticket sales, and your donations go toward the restoration of the building and preservation of Houston's civil aviation history. Many projects are underway to maintain and restore the building as it was back when it opened in 1940. Thank you for your donation to the museum!